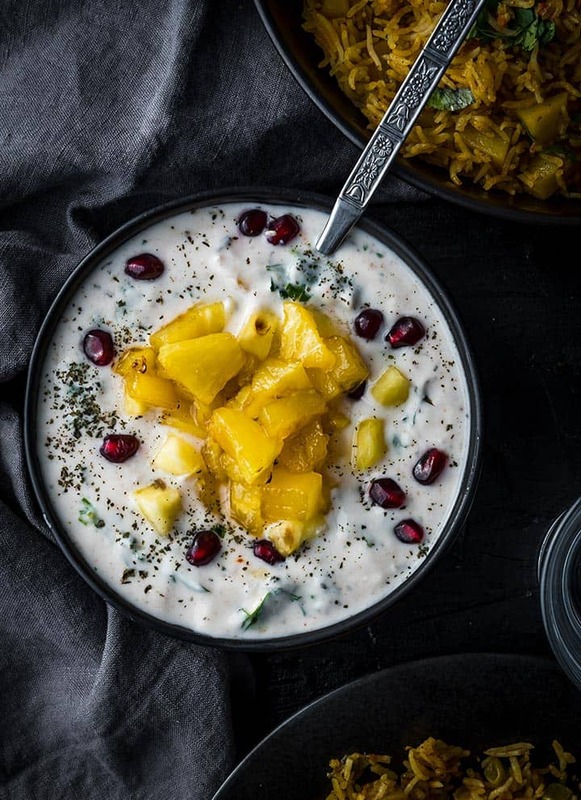 Delight your guests by serving this sweet and tangy pineapple raita – a yogurt-based condiment that is a cooling accompaniment to spicy biryanis and parathas. Most people like to finish their meals with dessert. 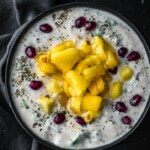 For some, it has to be raita – a yogurt-based condiment made by adding either fruits or vegetables to yogurt along with a few spice powders such as chili and cumin. Pineapple raitas are the best because it fulfills the need of both – dessert as well as raita. Sweet and tangy pineapple, when combined with freshly whisked chilled yogurt, along with sugar, salt, and some chili and cumin powder is pure bliss. It is so delicious that I’ll share this advice with you – always make more than you think you’ll need – this addictive raita will be gone in seconds. The cooling effect that yogurt has is perfect to counter the heat and spice that our curries and biryanis are so well known for. No wonder most Indian meals are often accompanied by raitas. The hero of this recipe is pineapple, that’s why if you want your dish to really shine, make sure you use a well-ripened pineapple. Fragrance – Do the sniff test. Sniff the base of the fruit and it should smell fragrant. Feel – Squeeze the pineapple and it should be ‘slightly’ soft. Color – A ripe pineapple is usually golden yellowish in color with bright green leaves. If it has turned orange, it is over-ripe and past its prime. It is best to pick a ripe pineapple then picking a green one and allowing it to ripen on your countertop since they achieve maximum sweetness when harvested ripe. Can I use canned pineapples for this recipe? Yes, you can – just drain the liquid and chop the pineapple pieces to the desired size. I believe that the taste of fresh pineapple can’t be beaten so that would be my recommendation. 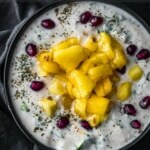 How to prevent pineapple raita from getting bitter? Consume the pineapple raita in a couple of hours. Heating destroys this enzyme – Saute the pineapple before adding to the raita. If you are wondering if it impacts the taste, don’t. My recipe calls for caramelizing the pineapple and that not only prevents the bitterness, but also adds an extra dose of sweetness (a.k.a deliciousness) to this recipe. Use canned pineapples – pineapples are heated before they are canned and that takes care of the bitterness. If you love raita as I do, here are two other raita recipes for you to check out – Cucumber tomato raita and cucumber raita. 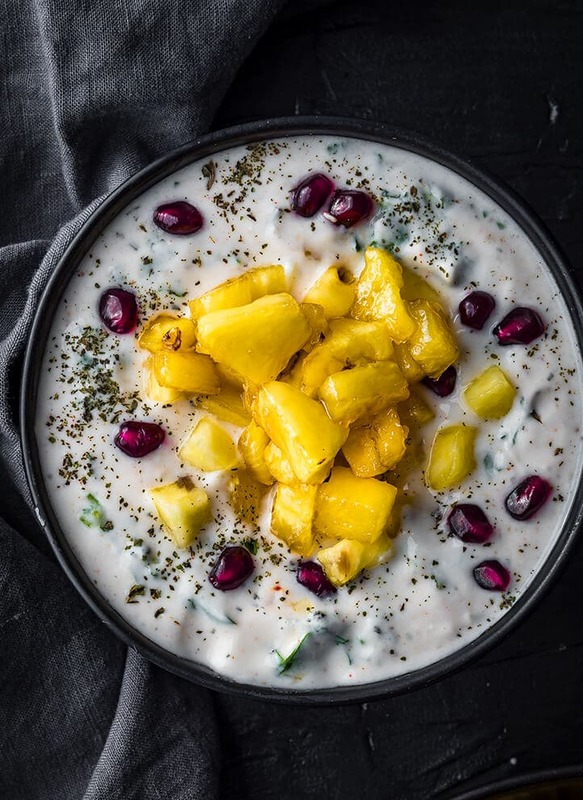 Delight your guests by serving this sweet and tangy pineapple raita - a yogurt-based condiment that is a cooling accompaniment to spicy biryanis and parathas. Place a pan over medium heat and add pineapple chunks and sugar. Cook for about 2-3 minutes and turn the pineapple chunks once. Shake the pan to allow the caramelized sugar to coat the pineapple nicely. Cook for another 2-3 minutes till the pineapple turns golden brown. Whisk the yogurt till it is smooth. Add the remaining ingredients (chili powder, pepper powder, black salt, roasted cumin powder, and mint leaves) and mix well. Do a taste test and adjust the seasonings as needed. Refrigerate for an hour. Sprinkle with cilantro and pomegranate arils before serving. Use thick yogurt for best results. Pineapple raita can be stored in the refrigerator for a couple of days but it tastes best when consumed the same day. Yogurts in India are sourer than the ones found in the US. To cut the sourness, add 1/4th cup milk. Make sure you are using thick yogurt or strain the yogurt if needed before adding milk. If the pineapple is letting out juice while it is being cut, reserve the juice and add it to the raita.